As a Canadian Forces Chaplain, one of the more pleasant duties I perform is that of officiating at weddings. I have had only two rules to guide which weddings I will do and which I will turn down: I need to be able to meet with the bride and groom first, and I don’t do weddings in unusual places (like parachuting or underwater). But I broke both rules once, and it was the most meaningful wedding I have ever celebrated. I’d agreed to do this wedding on two days’ notice, as the minister who was to officiate was called away on a family emergency. I had the location (well out of town, on a farm); I knew the names of the bride and groom; and I knew that they’d completed pre-marriage classes with the other minister. I also knew something about their wedding guests and the particular setting they’d chosen for the celebration of their union. One hundred and forty bikers had come up to spend the weekend. The wedding was to be an added bonus – a surprise to all but a handful of the guests. I confess to considerable misgivings as I turned off the highway onto the property and caught my first glimpse of the venue. Dozens of motorcycles were parked in one section of the field. Most were Harley-Davidsons. Very loud music filled the air from a refreshment area in the centre field. Tents dotted the landscape. It looked like a heavy-metal Woodstock. Mine was the only Jetta in sight. I parked it and headed up to the house. To my relief, things seemed to be in order there. I was introduced to the bride’s parents and the groom’s parents while the bride was getting dressed. It didn’t take long; jeans and a black T-shirt needed little more than a few flowers in the hair. 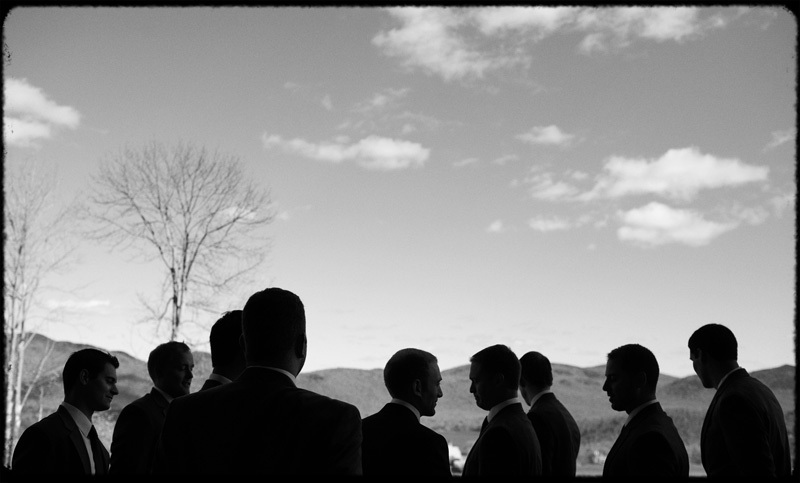 The groom was introduced to me as “Bear.” It wasn’t hard to know where the nickname came from – Bear outweighed me at least two to one. His beard was thick and bushy, and his arms were heavily tattooed. Bear didn’t say much. We checked to see that the license was in order, and when everything was ready, I headed down to the main tent. I don’t push through crowds very well, the meek and mild sort that I am, but I managed to get to the front, asked for a microphone, waited for the music to stop, introduced myself and announced that I was here for a wedding. I wasn’t sure what kind of reaction I would get. Several of the bikers immediately headed to the parking area. The air was filled with the throb of powerful engines revving. Then, with almost military precision, the bikes pulled out and streamed toward the centre field, heading directly toward me. A few feet away, they turned off to form a double row facing each other – an honour guard to create an aisle for the bride. With engines at full throttle, their roar echoed across the valley. As the bride walked slowly and gracefully down this aisle, each bike she passed switched off its engine. As she passed the last pair and all the engines were stilled, you could have heard a pin drop. She walked shyly up to Bear. His eyes were overflowing with tears. The couple were surrounded by the congregation of their friends: members and families of the Sober Riders, each one a recovering alcoholic, each one a biker. Each one was bowed in prayer as we entered a holy moment. The bride had given me only one instruction for the service. “Make sure you have a sermon,” she said. “These people want to hear a word from God.“ I stood in the middle of the field, in a congregation of T-shirts, jeans and tattoos, in front of a groom and bride who knew exactly what they were doing and why, in a cathedral of fence-posts and Harleys, and together we gave thanks.